Last week our very own Director of Training and Education, Aaron, popped down to London to attend a Teach Too conference at the House of Lords. The event, chaired by Baroness Margaret Sharp, focussed on a very important question for the future of tech in the UK: what needs to happen to ensure the growth of digital skills? Bryn discusses. In a recent blog we spoke about the problems of getting women into tech and how the solution starts in school. Getting young people, both men and women, inspired by technology is vital to meeting the IT challenges of future. But so is teaching the right skills to those who want to pursue a career in tech in the first place. The evidence suggests there is still a lot to be done on this front. Figures from General Assembly suggest that the UK will need an extra 750,000 skilled workers in digital by 2017. If that’s the case then surely tech education needs to up its game now! The main gist of last week’s debate was how to meet this challenge head on. The answer: businesses need to engage and create links with schools, using their insight to help shape the curriculum. At UKFast, we work with around 10% of the schools in Greater Manchester, reaching over 30,000 students. We run masterclasses, hold open days and provide work experience; all in the name of getting young people into IT. So to hear this message coming from the government is music to our ears! “Tech companies need to recognise that, in a few years, it might become really difficult to find young talented people with the right skills to join their business. It’s the responsibility of the industry, not just schools and colleges, to engage young people and inspire them towards the jobs we desperately need them to fill. We’ve seen how beneficial such collaboration can be. 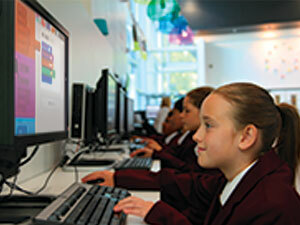 Right here in Greater Manchester we’ve been helping Oldham College develop their IT curriculum. Now Oldham can continue to deliver high quality education but with the industry insight needed to focus on the skills that the tech community needs. For us, it means we get another education partner to add to our growing list of friends and another fantastic institution full of talented youngsters to bring into the UKFast family. We’re really excited about the future of tech in the UK; businesses have the opportunity to mould the next generation of tech superstars and put digital skills at the forefront of the educational agenda. But for that to happen, cooperation between the tech industry and schools needs to continue to grow and evolve. What do you think? Should businesses be taking a more active role in shaping education? For more information on what UKFast is doing to future-proof the digital economy, visit the training and education section of our website.